I heard this morning that today is national ravioli day! Will you be partaking? I'm going to have spinach ravioli with a kale pesto cheddar cream sauce here shortly, sorry I don't have a pic of that instead. I'm having ravioli tonight in honor of it. I already ate, but I would have if I knew sooner. Were you eating it out of a can? It's the International Day of Happiness, so I guess if eating ravioli makes you happy it all works! It's that too, and the first day of spring! Breakfast in bed or dining? What are your favorite go to sweets? Who wants to eat this pizza with me? Do you like fettuccine Alfredo? If you drink, what drink do you usually order? That one you ate sounds good. I haven't eaten it in a minute. But it does taste good. Do you like that stuff? Personally I don't think that should even be compared to the fresh stuff. I've always eaten it out of a can heated up or cold I never had it home made except for the restaurants and they were not that Big of a deal at the restaurants. The can was better from what I've had in the past. I'm a big fan of homemade spaghetti and meatballs with meat sauce along with garlic bread. Are you a chef? Man, I couldn't even imagine eating that stuff cold. I'm surprised you didn't have a better restuarant ravioli experience. Homemade pasta bolognese and meatballs with garlic bread is soooo good. I'm just a home cook. Yeah your right but sometimes I am to lazy to heat it up. That is also true. Heard it on the radio this morning. I unknowingly partook in it. I already ate my ravioli! Any reason to eat pasta is always a good idea. I wish, but I already ate! 10 Benefits to Why a Girl Shall Stay Virgin Until Marriage! The down side of hooking up Relationship Advice Everyone Needs To Know! Successfully Appeal to and Attract Women Why be insecure? 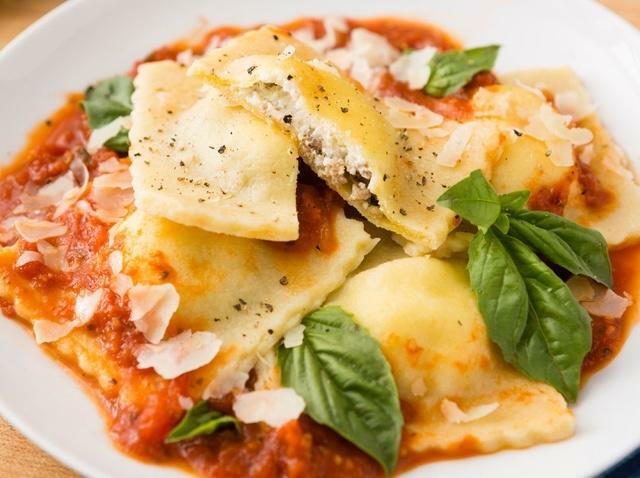 Home > Food & Beverage > Eating ravioli today?